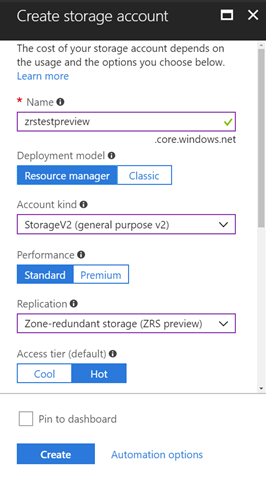 We are excited to announce the public preview of Azure Zone Redundant Storage (ZRS). ZRS greatly simplifies development of highly available applications by storing three replicas of your data in different Availability Zones, with inserts and updates to data being performed synchronously across these Availability Zones. This enables you to continue to read and write data even if the data in one of the Availability Zones is unavailable or unrecoverable. ZRS is built over Availability Zones in Azure which provide resilience against failures through fault-isolated groups of datacenters within a single region. Zone Redundant Storage should be considered for applications where regional availability is critical and downtime is not acceptable, and both read and write access are required at all times. With the release of the ZRS public preview, Azure offers a compelling set of durability options for your storage needs including ZRS for intra-region high availability, locally-redundant storage (LRS) for low-cost single region durable storage, and geo-redundant storage (GRS) for cross-region redundancy for disaster recovery scenarios with read access geo-redundant storage (RAGRS) offering additional read accessibility. The ZRS preview will initially be available in the following regions with more to follow. Please check our documentation for the latest list of regions with ZRS preview enabled. 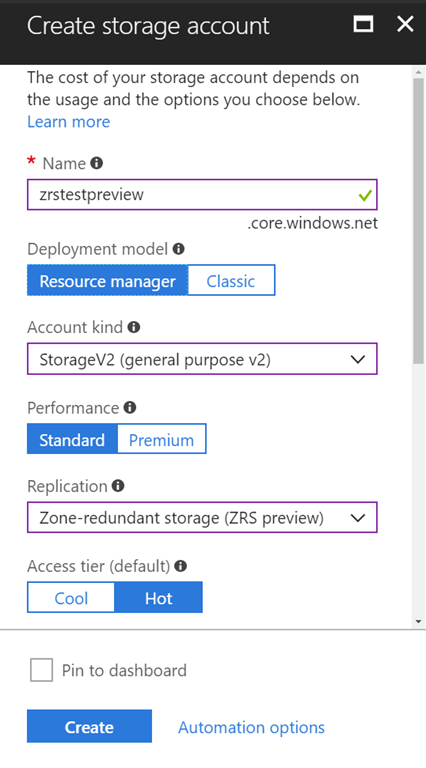 You can create a ZRS storage account in the preview regions mentioned above through a variety of means including Azure CLI, Azure PowerShell, Azure Portal, Azure Resource Manager, and the Azure Storage Management SDK. To create a ZRS account in the Azure Portal, set the following properties. Please note that ZRS requires a general purpose v2 account kind. There is no change to existing API for reading and writing data in a storage account, so existing code and tools will just continue to work when pointed to a ZRS account. Please refer to the ZRS documentation for more details on getting started. For information on preview pricing, please refer to the pricing pages for Blobs, Files, Queues, and Tables under ZRS (preview) pricing. Once ZRS is made generally available, the option is intended to replace the existing ZRS option in regions that support Azure Availability Zones. Effective immediately, the existing ZRS offering has been renamed to ZRS Classic and can continue to be accessed without any code change required. We will provide a simple migration path for ZRS Classic accounts to ZRS when it is generally available in that region. For more details on migration, including migration from LRS, GRS, and RA-GRS accounts, please refer to our documentation and FAQ. Please let us know if you have any questions or need our assistance. We are looking forward to your participation in the preview and hearing your feedback.